“Why, I’ve read that over and over!” Betsy cried. This inscription, in Maud’s handwriting, is found inside a well-worn, hardcover book, “The Beloved Vagabond” by William J. Locke. 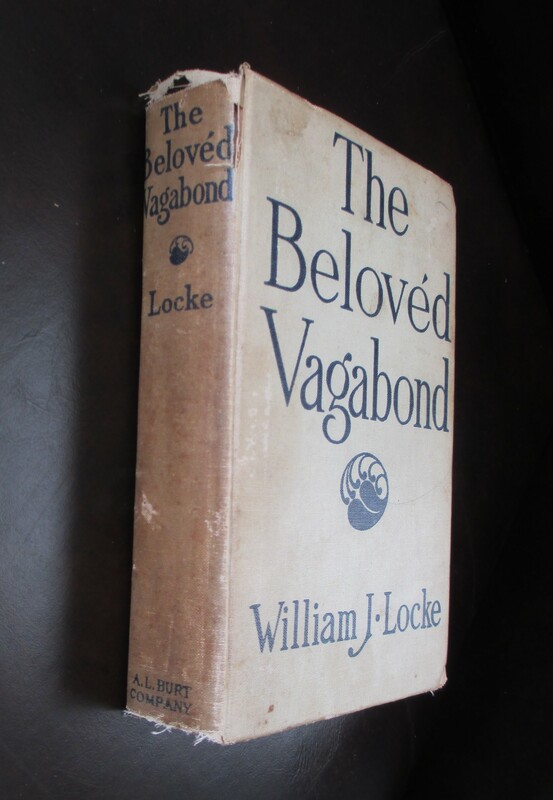 “The Beloved Vagabond” is a 1906 British novel written by William John Locke and is his most famous work. 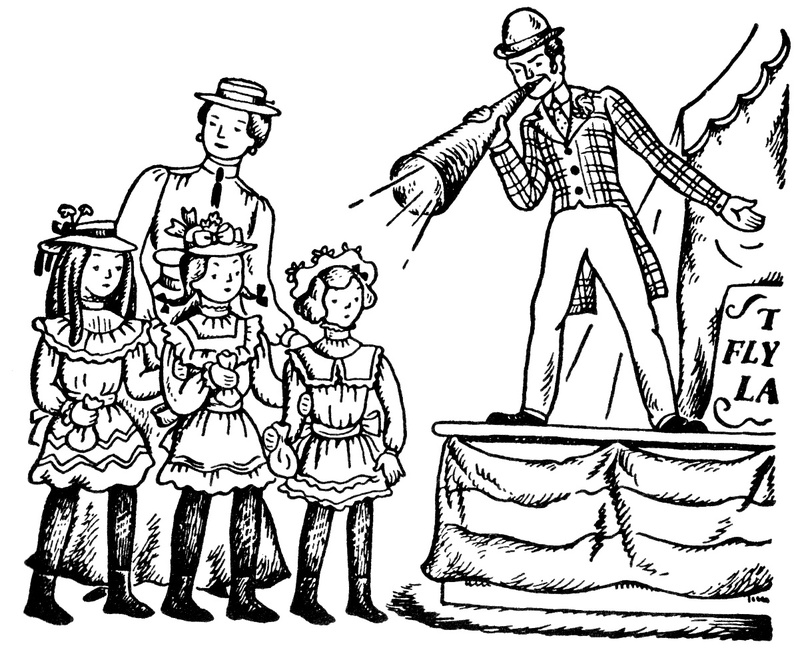 The book, set in nineteenth century France, is about an architect who decides to disguise himself as a vagrant. 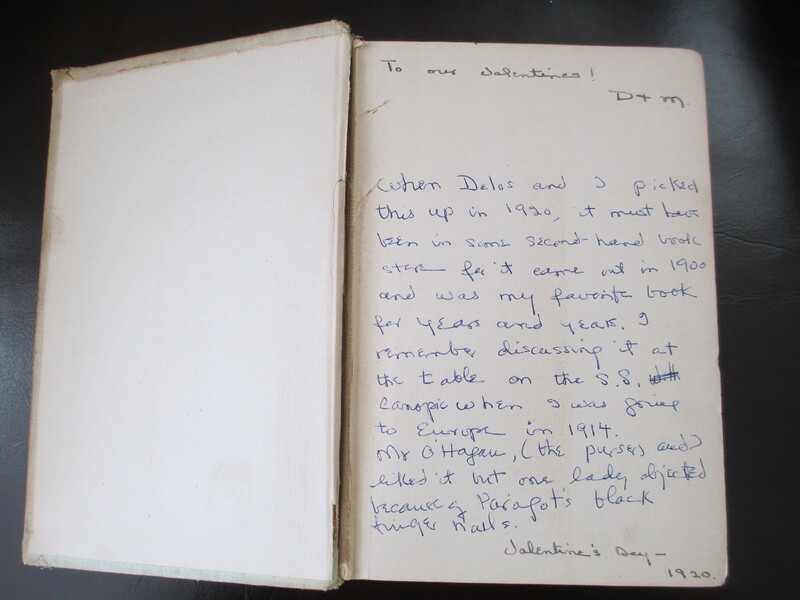 Maud tells the story of this gift the couple bought for themselves on Valentine’s Day in 1920 in this inscription. Little did she know that many years later the book and its back story would be shared with her fans. The book was donated to the Betsy-Tacy Society by the estate of Merian Lovelace Kirchner and is on display at Tacy’s House in Mankato (Deep Valley). not at the lake yet…” Joe said. “And have a baby,” Betsy put it. Maud and Delos had been married for six years when they learned that Maud was pregnant with their first child. It was 1924 and the couple was renting a house at 1109 West 25th Street in Minneapolis. On February 13, 1925 at 3:25 am, Maud delivered a full-term baby boy at Hillcrest Surgical Hospital. According to Maud’s obstetrician, the delivery was easy and the birth was not premature. Maud actually went two weeks beyond the due date the doctor had given her. The baby’s lungs functioned a short three hours before he passed away. In a letter written to her family in 1931, Maud remembered that the baby was “still as a mouse” during the week before his birth. There was no first name listed on the birth and death certificates for baby boy Lovelace. He was buried in Lakewood Cemetery in Minneapolis, without a marker. The Lovelace’s would have named their son Thomas after Maud’s father. “You don’t know…you don’t know, until you have a baby. It’s closer to you than your own life is. What is a dimity dress? Dimity is defined as a light-weight, strong cotton wash fabric with woven stripes or squares. A dimity dress is merely a dress made of dimity fabric. The 1895 Sears & Roebuck and the Montgomery Ward catalogs give this description of dimity fabric: “Dimities are perhaps the most popular line of fancy white goods in demand this season. Their beautiful sheer textures and fine dainty patterns are a very strong recommendation to favor.” The catalogs offered striped and checked dimity that sold for 10-35 cents per yard. Dimity is a tough fabric, in that it does not yellow easily and can stand up to a lot of wear and tear. Traditionally, dimity was made completely of cotton fibers, although in recent years some synthetics have been mixed in with cotton to create one type. This fabric was affordable, light-weight and strong for summer dresses for girls and women in the Betsy-Tacy era.